I enjoyed re-runs of THE LONE RANGER and ZORRO when I was a kid. I also remember picking up the novel SHANE from the school library in second or third grade, but I honestly can't recall whether I ever finished it. But I've generally been more impressed by sci-fi, supheroes, and fantasy, which retain the romantic aspects of the Western without the darker implications. At some point I realized that the West wasn't a nice place to live. Since I turned ten, my experience with Westerns has been limited. I enjoyed TOMBSTONE more than UNFORGIVEN. I also enjoyed the Western angle in BACK TO THE FUTURE III, which felt like a return to more innocent times. The directors actually cut a scene from the film where Mad Dog Tannen shot the Sheriff in cold blood, for which I'm thankful! All that said, I'm still very drawn to the idea of the Western. It's a nice backdrop for themes of redemption and mercy, especially since the American landscape is much safer now than it was then. So there's an element of hope on the horizon, even when the West is at its bleakest. Happy Trails to you and the Story, JMD! Thanks, David. I've never seen TOMBSTONE...maybe I'll check it out. I'm still marveling (and scratching my head) at the fact that I'm writing a Western. And I can't wait to see where this story leads me. It's been an exciting process. Happy Trails right back at you! Want to hear... well, read an interesting fact? My maternal grandfather in the years before he married my Jewish-born grandmother, was a cowboy of sorts. He broke, cared for and trained horses for the police, and other assorted areas, but that isn't where it gets interesting for you. 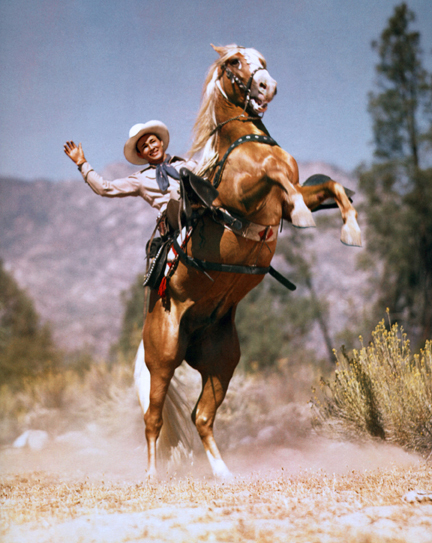 At one point he was out in California, and was in a rodeo or two with Roy Rogers. Now, I don't think they where best friends or anything, but still, weird. Interested in another interesting fact? No? too bad, deal with it. My Father is a pretty big fan of the Lone Ranger, and even read Clayton Moore's biography a few years back. No, that wasn't the interesting part. Anyway, it turns out Jay Silver (Tonto) had Mr. Moore made an honorary member of his tribe. Contrary to popular belief, based of his last name most likely, Jay silver was not Jewish, he was a full-blooded member of the Mohawk tribe. And Silver was a stage name, his real last name was Silverheels. Well, that concludes the "fun fact" part of the communication. But if you need any inspiration to get western juices flowing of got a suggestion or two. First, "Blaze of Glory: The Last Ride of the Western Heroes," by the ever-talented Mr. John Ostrander. And Second is the television show Justified. While Justified takes place in modern times and is set in Kentuckey, it as absolutely in the western tradition. part western, part crime drama, and centered around a character created by the author of the short story which inspired "The 3:10 to Yuma" it is at least worth checking out. of course my guess is that this western will be more like "Mr. Denton on Doomsday" spliced with god only knows... and I look forward to it. It's interesting though, even three years ago I would have sighed at this news and said, "Well it IS Dematteis. I guess I'll check it out... maybe." Why? Well, despite my favorite Star Wars character being Han Solo, I never really dug westerns. I mean, sure I'd seen the great western films, and even read Jonah Hex monthly, and I wouldn't change the channel, just because one was on, but before that I just wasn't a big western guy. Then 3 years ago, for some reason it all clicked, all the things i liked that are found in westerns came together. I mean I still prefer science fiction (and non space Operas aka space westerns either) superheroes, film noir and horror a far more, but now there is a special place for westerns. There is just something infectious about the genre. So, to make all that rambling make sense I'll just say this, I am stoked to see what kind of western this could be. A number of people have recommended 3:10 TO YUMA and JUSTIFIED, Jack. I'll have to check them out. I've also heard great things about DEADWOOD. I love that your grandfather was in a rodeo with Roy Rogers! How incredibly cool is that? Thanks for checking in, Jack. Always a pleasure. See you out on the plains! That's very interesting, Jack, and way cool! Han Solo is a great example of Western motifs being incorporated into a fantasy epic. Especially the Mos Eisley Cantina scene, which just screams Western. BTW, JMD, I got home from work Friday night and my son wanted to play cowboys! He hasn't touched his toy six-shooters since I don't know when, and suddenly we're running around the house playing Western. Really funny how stuff like that gels. And playing with him I realized that you never really transcend the things you love as a child. Not that you should try, anyway. Will this Western be all-ages? I know of at least one nine year old kid who's ready to roam the plains again. That's wonderful Western synchronicity, David. Interesting that he wanted to play cowboys when you consider that the Western is so distant from most kid-friendly pop culture these days. The idea I'm working on isn't all-ages. It's going to be pretty gritty and realistic (except for the parts that aren't, of course); so you're son's going to have to wait a decade or so to read it. Or watch it. Or WHATEVER this thing turns out to be!